Apple today announced it has updated its flagship digital audio authoring tool Logic Pro X and MainStage, its live-performance app. Both now support Alchemy, a sample-manipulation synthesizer plug-in derived from Apple’s acquisition of Camel Audio earlier this year. The plug-in features numerous sound generators as well as special effects filters and tools such as arpeggiators and oscillators. More than 3,000 presets, which span a large number of musical genres, let you pick the sound you’re looking for from Electronic Dance Music to Hip Hop as well as emerging styles. You can choose category, timbre and articulation keywords to aid in your search and then assemble favorites via star ratings and keywords. The controls let you click and drag on the Transform Pad to move among eight different sound variations. You can automate controls and combine up to four synth engines, using the Morph Pad to morph between sounds. The Logic Pro X update features Force Touch controls, and registered artists can now upload tracks directly to Apple Music Connect for fans. 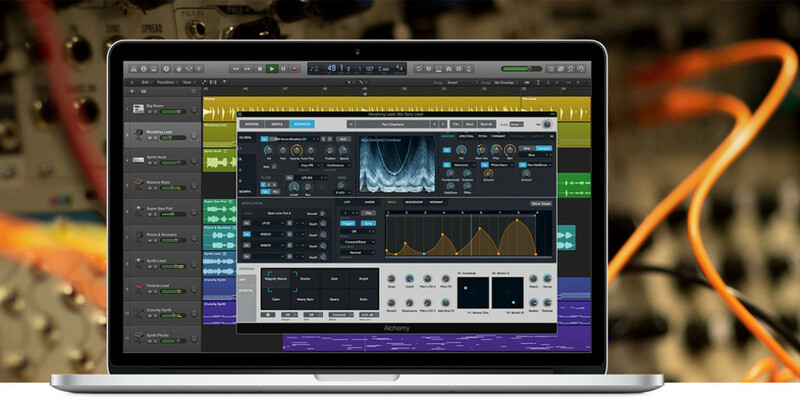 Logic Pro 10.2, which works with OS X 10.9 or later, is available for $199.99. The new MainStage 3.2 is $30. Updates are free for current users. Logic Remote, the free iPad companion app, has also been updated.